Barnsley legend Bobby Hassell said a special goodbye to the club as he scored the opener in a seven-goal thriller at Oakwell on Saturday. The former long-serving Reds skipper opened the scoring from the spot in his testimonial against his first club Mansfield Town, and declared his delight to be able to say such a fond farewell to the Barnsley faithful. “It was a great way to say goodbye in a proper manner,” said the 35-year-old, who made nearly 300 appearances in a decade at the club. “I was a bit apprehensive before and I hadn’t kicked a ball for six weeks. I didn’t know what my touch was going to be like but it came back to me straight away. The Stags went 2-1 in front just before the half-hour mark as Matt Green and Reggie Lambe beat keeper Adam Davies, before Barnsley trialist David Ball scored a stunning equaliser. Alfie Mawson’s ball over the top was perfectly weighted, and Ball produced a superb lobbed finish from outside the box. The Reds included on-loan Manchester United duo Ben Pearson and Joe Rothwell in their starting line-up despite the pair completing their deals just a few hours before kick-off. The returning Pearson played a pivotal midfield role in the second half of last season, but it was new boy Rothwell who got his first goal in Barnsley colours as he popped up in the box to prod home from James Bree’s cross midway through the second period. Eleven former Reds favourites such as David Preece, Paul Heckingbottom and Daniel Nardiello piled onto the field with 20 minutes to play, and it was Nardiello who put his side further in front, heading home at the far post from Neil Austin’s cross. The Stags reduced the deficit with five minutes remaining after tricky footwork and a neat finish from Craig Westcarr, but it was to be the last of a seven-goal spectacle. Reds manager Lee Johnson enjoyed the last 20 minutes and made sure his young squad watched the senior players with intent, declaring that they could learn a thing or two from the old boys. “I thought it was brilliant,” beamed the Barnsley boss. “It showed exactly what we’re about and it showed you exactly what senior players can give you. “You see the pot-bellies and some of them struggling to move, but their decision-making was fantastic. It was really good to watch and I really enjoyed it. 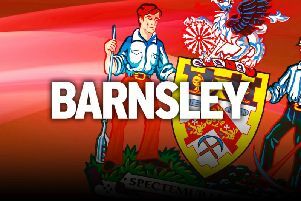 Barnsley: Davies (Preece, 70), Bree (Heckingbottom, 70), Mawson (Templeton, 63) (Reid, 70), Nyatanga (Foster, 70), Smith (Austin, 70), Scowen (Shuker, 70), Hassell (Roberts, 30) (Hassell, 70), Rothwell (Howard, 70), Pearson (Kay, 70), Ball (Devaney, 70), Wilkinson (Nardiello, 70). Mansfield Town: Shearer, Hunt (Shires, 66), Tafazolli, Collins (Fitzpatrick, 66), Benning (C Green, 62), Chapman (McGuire, 62), Clements, Rose (J Thomas, 45), N Thomas (Westcarr, 45), Lambe (Dwyer, 66), M Green (Beardsley, 62).